A major beach resort, Pecatu sits on the southern peninsula of Bali. Limestone hills dominate much of the landscape, bracketing sandy beaches and creating plenty of secluded spots ideal for tranquil Pecatu vacations. 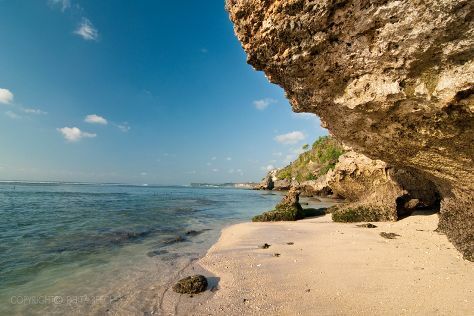 Thanks to their natural surroundings, some of Pecatu's beaches can be hard to reach. The area's relatively secluded location adds to a feeling of privacy, no longer possessed by places like the nearby Nusa Dua. Popular with surfers, the area offers some of the best waves in Bali. Pecatu's scenic hills hide numerous temples, shrines, and retreat spas. Pecatu is in Nusa Dua Peninsula. Make Pecatu central to your Indonesia travel plans using our Indonesia trip itinerary tool . Check Jalan Labuansait for affordable guesthouses, boutique hotels, and rental apartments. Move west to find more expensive and luxurious resort hotels, snuggled up to the coast. For easy access to modern developments like golf courses and spas, take a look at the hotels near Jelan New Kuta Raya, where pricey rooms come with a high level of luxury.